Burger King is running an odd sort of deal where you can get a Whopper for just one cent when you use the BK App to order the Whopper within 600 feet of a McDonald's restaurant. The idea here seems to be to sort of divert people going to McDonald's to Burger King. As such, they're calling it the "Whopper Detour." When you are within 600 feet of a McDonald's restaurant, the app will unlock an offer good for a 1-cent Whopper. Once you select the offer, the app will navigate you to the nearest Burger King restaurant to grab your Whopper. The deal can only redeemed once at participating locations through December 12, 2018. Update: 12/5/18 - Apparently, the availability of mobile ordering and participating in the promotion varies quite a bit according to comments left on Burger King's Twitter and Facebook pages. Additionally, a number of people are having problems getting the app to register that they're at McDonald's to unlock the coupon. 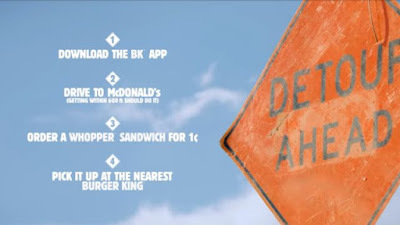 The general gist seems to be that while the marketing idea was brilliant, the lack of execution has left the app driving traffic to McDonald's restaurants (since folk are already there and can't get the coupon to work).